What was the world like millions of years ago? If you can't time travel to that time, you can always play a slot game based on that premise. Go back to the 2 Million BC and play a slot game! 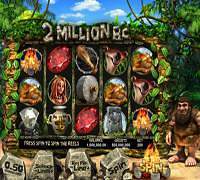 2 Million BC is a slots machine game based on the time when man and woman were cavemen. From the environment to the people, you're presented with a presentation that represents what man was like when they were still scribbling on rocky walls and hunting for food. The quality of the graphics give the game a much-needed boost in visuals. 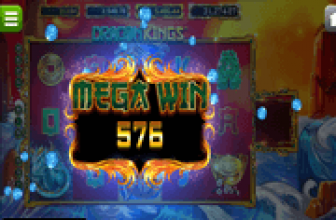 Don't worry; the slot game play is just as good as the visuals. 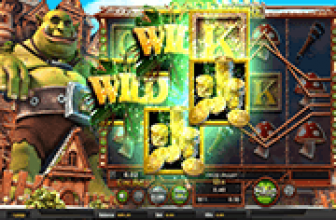 The game creates this gaming experience and the theme of the game through its wonderful 3D visuals, which is something that Betsoft Gaming video slots are well known for. This is why players will see the caveman beside the 5 reel set, he will join players as they enjoy the experience and celebrate their winnings. The same can be said about the visuals and the symbols that are going to appear on the reels to trigger the special features of the game and give players great line pays. They are inspired by the theme of the game, 2 Million B.C. These symbols will turn into 3D animations whenever they are a part of a winning combo or when they are triggering a special feature or a bonus. Slot gameplay doesn't disappoint at all. It lets you bet max and it lets you get a chance at luck with the bonus symbols like the wild symbol. 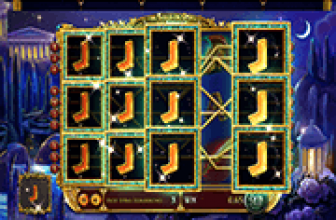 You get a chance at free spins and upping the multiplier to multiply your winnings higher than ever before. You can also unlock the Saber tooth Attack round, where you have to attack the said Saber tooth with an acorn. Doing so gives you a cash prize. So you will not only enjoy a highly rewarding bonus round, but an action packed feature that is interactive and fun. If you've always wondered what it was like to live like a cavemen, play 2 Million BC and discover the world before technology came. Plus, have a good slot game play while you're at it that is full of great rewards, line pays, special features and bonuses. Of course, being a Betsoft Gaming powered slot vouches for its visuals experience and its rewards.